Are you looking for online classes for your homeschooler? 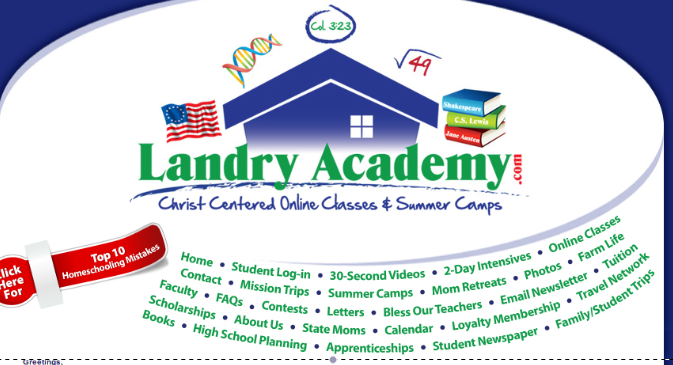 Landry Academy offers a wide variety of classes from sciences to arts, literature and even photography! My friend's son, who has been taking the classes for some time, enjoys the opportunity to interact with the other students in his class. His mom appreciates the professionalism of the caring teachers her son has encountered. Founded by a homeschool dad who has also been a college science professor and advisor, Landry Academy also offers Science Intensives, Mom's Science Retreats and Missions trips. I have been very impressed with their offerings and we will be taking their classes beginning next year.